This week’s books combine knowledge and food for two informational reads and of course, some delicious recipes to boot. 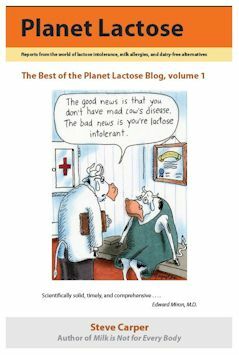 The first is a fun one, Planet Lactose: The best of the blog is a neatly organized collection of featured posts from lactose intolerance guru, Steve Carper. The bits and bites (almost like reading a series of newspaper and magazine clippings) are sorted into the following chapters: Lactose Intolerance, For the Vegans, Probiotics, Dairy and Other Allergies, Babies: Formula and Feeding Issues, Food and Nutrition, Dairy and Nondairy Milks, A Hungry Person’s Collection of Cookbooks, Genetics, Product Reports, Animal Planet, and Miscellany and the Just Plain Weird. 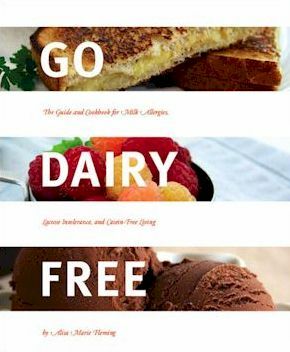 The second, Go Dairy Free: The Guide and Cookbook (you might recognize this one?) is half information, half recipe, substitutes and more. 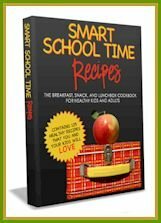 Whether you are dairy-free, wanting to cut back a bit, or simply interested in the diet, I think you will find it a good read and a good baseline for recipes. It is vegan-friendly (egg-free and meat-free options for all!). I know some of you are already Go Dairy Free owners, but I won’t fault you if you want to win a copy to give as a gift. 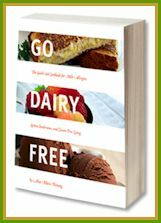 I was just going to giveaway Planet Lactose this week, but thought I would throw in a copy of Go Dairy Free since I was feeling extra generous and the two books go together well as (dare I say) *must* reads for anyone who is dairy-free. 1st Entry – Comment and answer the following: Do you follow any type of free-from diet? 2nd Entry – Become a fan of Go Dairy Free on Facebook (or in other words ‘Like’ it), and leave a comment here letting me know you did (or that you already are a fan!). 3rd Entry – For another chance to win, share this giveaway via facebook, twitter, or your blog, and leave a second comment here letting me know that you did. Entries will close on Monday, August 16th! The Summer Book Series Giveaways will go on every week in July & August, so stay tuned! I’m a vegetarian who is in the process of going vegan so I’m meat-free, dairy-free, egg-free. I am a mountain guide taking people mostly to the himalayas, where milk is unpasteurised and i beleive this has contributed over the years to my inability to digest lactose, casein and all dairy products. Your site is a blessing as i like to keep my self in top shape which your ideas and recipies help me do. Thankyou. i’d probably say i don’t follow any specific diet… while I have made some switches due to lactose intolerance (almond milk and coconut milk ice cream), I still enjoy certain cheeses and greek yogurt without problems. I also have decreased my meat intake, but still enjoy on occasion. so maybe the best way to describe my diet is flexitarian! I am interested in starting a vegetarian diet, I did go veg when I was younger, but I was really eating a junk-food-etarian diet. After much research, I am really excited about a change, an am looking forward to the challenge. my daughter is going through testing for food allergies. she’s 5 and hates going without. so i’m doing it with her and finding that my body freaks out with dairy. guess we’ll be trying to figure out what sets me off as well as my daughter. Yikes! I follow a dairy free and (mostly) meat free diet. I am newly lactose intollerant and get violently ill from consuming anything with dairy products in it. I have to read labels really closely!! I am already a fan of Go Dairy Free on FB. I love the posts and read them all!! I posted your info on my facebook page! My granddaughter is a vegetarian who loved cheese and cream sauces until she was diagnosed as lactose intolerant. Now she’s struggling with finding healthy meals that taste good. I’d love to win these books to share with her. I’ve “liked” Go Dairy Free on Facebook (Gaye McGill). My diet is very restricted… no dairy, eggs, corn, or many processed foods. Fortunately, there are so many great substitutes out there, I don’t feel deprived at all! Lactose intolerant.. so free from dairy here! I don’t have any food allergies or intolerances, but my son is severely allergic to 7 different foods, only 4 of which are in the big 8. So I’ve done my best to adapt our family’s meals so that we can all eat them…since I prefer to cook dinner only once. My husband is lactose intolerant, has been for years, and now I want to go back to vegetarian. Many of the dairy free cookbooks rely heavily on meat dishes, or they go the other way and are vegan. We are not vegan, we harvest our own eggs, but I can’t use a typical veggie attitude of simply adding more cheese to make the taste pop. So I am shopping cookbooks, and found your site. It’s appropriate time to make some plans for the future and it’s time to be happy. I’ve read this post and if I could I desire to suggest you few interesting things or suggestions. Perhaps you can write next articles referring to this article. I want to read more things about it!